Lisa recently created this beautiful BALAYAGE OMBRE for the fabulous Heather Cooper who drove all the way from Miami to Lake Worth, Florida to have her hair cut, styled and highlighted at Lisa Marie Owens Hair Salon. “Balayage” comes to us from the French, and literally means “to sweep”. This refers to the sweeping motion the stylist uses to “paint” the lightener onto the hair. Although this technique is recently gaining in popularity, it was developed in France in the ’70s. Lisa learned Balayage over 13 years ago, and has mastered the technique. The Balayage technique differs from the traditional foil highlighting technique in that it produces a more natural effect. The look is modern and chic and has great depth and dimension. The foil method leaves a line of demarcation where the lightener is applied, as it is brushed on the hair in a uniform fashion. Foil highlights require frequent visits to the salon. When applying Heather’s Balayage highlights, Lisa started just below the roots, and created a graduated color effect with a freehanded stroke. This result more closely resembles how the hair would naturally highlight. A natural Ombre appears sun-kissed and has a soft regrowth. 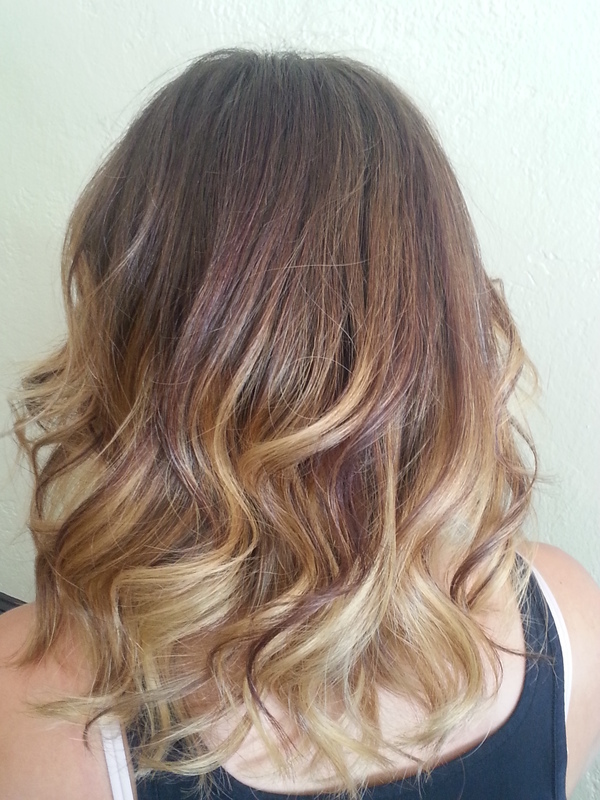 A Balayage Ombre requires less frequent maintenance than foils, so you can extend the time between salon visits. As each application is unique, Balayage is truly an art form. If a stylist is not well trained in the technique, the result may look splotchy. A well-done Natural Bayalage Ombre will give your hair a lived-in beachy look, a very popular style this summer. Lisa is in love with a new product just out from Pureology: Sea Kissed Texturizer, Salt Free Tousle Mist. This non-stripping, salt-free spray creates radiant shine to amp up your highlights and provides texture without adding weight or stickiness. You simply mist it on wet hair to create tousled waves. Come visit Lisa Marie Owens Hair Salon to see if Balayage is appropriate for your look.